Contact lenses are medical devices. For this reason, they should only be used with a medical prescription. Consequently, the sale of contact lenses online is illegal in Singapore (MOH, 2015). Not surprisingly, many are enticed by the low prices of lenses online. In addition, the added convenience of online shopping is another pull factor. However, as online stores are not regulated by authorities, one runs the risk of receiving counterfeit or unsafe lenses. Likewise, they become susceptible to the dangers posed by such. In other words, when you purchase unlicensed coloured contact lenses, you putting your eyes at risk. For instance, scientists from Japan analyzed three models of coloured contact lenses that were bought without prescriptions. 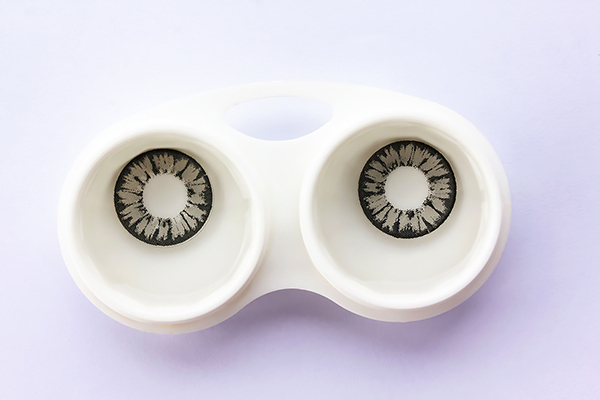 Unfortunately, the lenses were found to contain chlorine, titanium dioxide and iron – potential eye irritants. Furthermore, colorants in several lenses were not sealed properly. In fact, the colours began to seep after being rinsed. In this blog post, the writer shares her firsthand account the side effects ofcoloured contact lenses. She received the lenses from an unlicensed online retailer in Malaysia. After wearing them, she suffered from keratitis, corneal scarring and decreased quality of vision three months. In other words, beware of unlicensed lenses! Firstly, you should always obtain a valid contact lens prescription from a certified optometrist. Secondly, purchase contact lenses only from licensed optical shops. Additionally, make sure that the lenses are approved by the Health Sciences Authority (HSA)(list of HSA approved lenses). Exercising proper hygiene when caring for your contact lenses. For example, wash hands before handling, renew lens solution periodically, clean lenses regularly, do not use for longer than instructed. Lastly, visiting an eye specialist if your eyes feel uncomfortable after contact lens wear. In conclusion, it is not worth risking your eyesight for vanity. If you are suffering from any of these symptoms, it is recommended that you get your eyes examined by a doctor. An eye specialist can spot the early onset of symptoms to prevent the exacerbation of vision problems.